Queen Elizabeth II said she hopes Kate Middleton’s baby is born soon, because she is due to go on holiday. The comment was made to a 10-year-old schoolgirl while on a series of engagements in Cumbria. Wiggonby Church of England Primary School pupil Fay Batey asked if the Queen wanted the royal baby to be a boy or a girl. According to Buckingham Palace, the Queen will soon be heading off to her private Balmoral estate in Scotland, where she traditionally spends her summer holiday. Hundreds of people had crowded into a market square in Kendal to see the Queen and the Princess Royal. 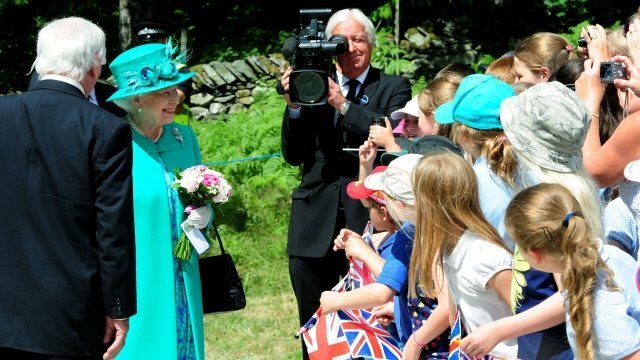 The royal party went on a brief walkabout during the 20 minute tour and received two posies from local schoolchildren. The royal visitors were greeted by loud cheers and Union flags as they arrived from nearby Oxenholme railway station. The Queen was later presented with a hamper showcasing local produce from the Made in Cumbria chamber of commerce collective.